I've been with Zacks for 18 years and very little surprises me anymore. But the results of some of our stock-picking strategies, one of which gained +98.3% since 2017, are pretty astonishing. Would you like to see today's picks from our best market-beaters for free? Of course you would. Just click the button below. Don't worry: clicking won't commit you to do a thing or spend a cent. "This is like a license to print money." - Bill C.
Our top-performing stock strategy for 2017-2018, called Filtered Zacks Rank5, racked up an amazing +98.3% increase. That's more than 6 times the S&P's impressive +15.8%. Its secret? FZR5 uses Zacks Rank #1 and recently received positive current quarter revisions. Then it drills-down to the top 5 stocks with the highest change to the Average Broker Rating over the last few weeks. For the next 2 weeks, you can access the daily stock picks from Filtered Zacks Rank5 along with several of Zacks' other proprietary strategies absolutely free. No credit card required. 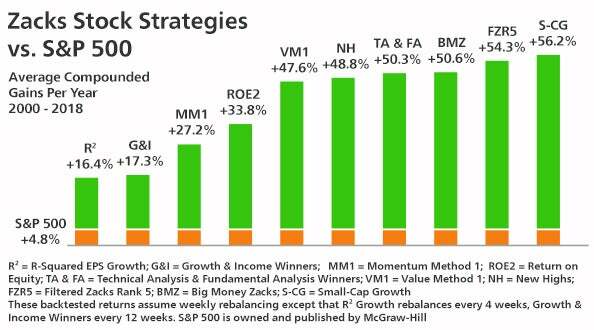 In fact, the Top 10 strategies more than doubled the market with an average gain of +36.2%. And now you can access Buy Lists from them all without cost or obligation to buy anything now or ever. But how have these strategies performed over time? 1. Daily Buy Lists of selected stocks. Try our Research Wizard stock selection program for 2 weeks absolutely free. It will give you access to stock lists from our proven winners in mere seconds at the touch of a button. It also allows you to modify our strategies or create your own. 2. 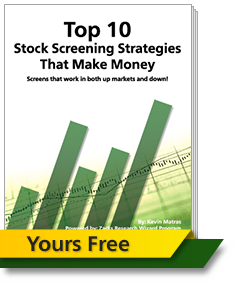 The formulas they use have been loaded into a Special Report, Zacks' Top 10 Stock Screening Strategies that Make Money. Today you are invited to download it free so you can find winners anytime (even after the free trial is over). Go ahead. Download theTop 10 Strategies report, view the stocks from our daily buy lists and find your own winners, too. No obligation. Get started before midnight Sunday, February 10 and you get another free bonus, Zacks' Top 5 Valuation Secrets. This Special Report shows how to quickly spot the best stocks for making money. They're glad they tried this out! "I've been using the Wizard for 11 months. In that time I have grown my portfolio by 81%! ... I am, for the first time in my life in charge of my financial destiny. Thank you, Zacks! I am happier than I ever imagined." "With the Wizard no benchmark stands a chance. If too many people discover it and start to use it, I'll lose a very valuable competitive edge." "Fantastic product, please make sure it doesn't get too popular :)"
No credit card needed. No obligation to buy anything now or ever. Just fill out below . . .
By clicking the button below, I agree to the Terms of Services and the Consent Policy below. Consent Policy: Zacks and its affiliates/agents can call me for any purpose at any number provided, including via automatic telephone dialing system, and such consent is not required to purchase goods and services as I may always call directly at 1.800.767.3771 ext. 9339. ¹ The results for the companies listed above are not (or may not be) representative of the performance of all selections made by Zacks Investment Research's newsletter editors. All images represented herein are commercially licensed from Shutterstock.com. *Past performance is no guarantee of future results. Inherent in any investment is the potential for loss. This material is being provided for informational purposes only and nothing herein constitutes investment, legal, accounting or tax advice, or a recommendation to buy, sell or hold a security. No recommendation or advice is being given as to whether any investment is suitable for a particular investor. It should not be assumed that any investments in securities, companies, sectors or markets identified and described were or will be profitable. All information is current as of the date of herein and is subject to change without notice. Any views or opinions expressed may not reflect those of the firm as a whole. Zacks Investment Research is not a licensed securities dealer, broker or US investment adviser or investment bank. The Zacks #1 Rank Performance covers a period beginning on January 1, 1988 to March 4, 2019. These returns are from hypothetical portfolios consisting of stocks with Zacks Rank #1 that were rebalanced monthly (see additional details regarding rebalancing below) with zero transaction costs. These are not the returns of actual portfolios of stocks. Zacks Rank #1 stock-rating system returns are computed monthly based on the beginning of the month and end of the month Zacks Rank #1 stock prices plus any dividends received during that particular month. A simple, equally-weighted average return of all Zacks Rank #1 stocks is calculated to determine the monthly return. The monthly returns are then compounded to arrive at the annual return. Only Zacks Rank #1 stocks included in Zacks hypothetical portfolios at the beginning of each month are included in the return calculations. Zacks Rank #1 stocks can, and often do, change throughout the month. Certain Zacks Rank #1 stocks for which no month-end price was available, pricing information was not collected, or for certain other reasons have been excluded from these return calculations. The S&P 500 is an unmanaged index. Visit www.zacks.com/performance for information about the performance numbers displayed above.